History: Jonathan Crane grew up a solitary child in the late 1920's, wiry and full of mischief. Even as a boy, Crane exhibited the characteristics that would determine the course of his life: cruelty and an obsession with fear. As he grew older, Crane developed a bookish personality and an interest in psychology. His pursuit of this interest eventually landed him in a teaching position at Gotham University in 1941. While this position afforded him opportunities undreamed of in his youth, he found himself ostracized by his colleagues. While Crane spent every dime he made on books and scholarly pursuits, he ignored the trappings expected of his rank in society. His colleagues ridiculed him privately for his clothes, his mannerisms and his reclusive lifestyle. Stung by their censure, Crane determined that to have both books and affluence, he needed far more money than his university income would allow. To meet his aims, Crane turned to crime. His modus operandi was based on his own obsessions with the psychology and an insulting description used by his colleagues: Jonathan Crane became The Scarecrow. In his first foray into crime, Crane used a tactic of personal terrorism. Preceding his arrival with a few wisps of straw, Crane appeared to his victims late in the evening and blackmailed them with certain death if they failed to meet his demands. His first client was Frank Kendrick, a businessman being sued by his partner, Paul Herold. 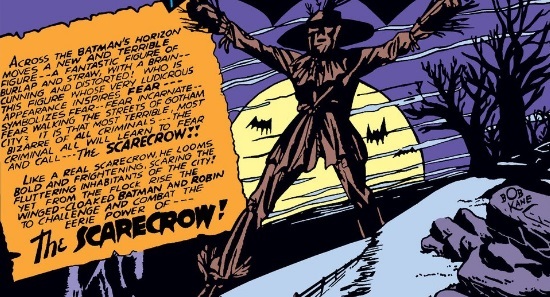 The Scarecrow offered to kill Herold unless he dropped the suit. After a single visit the Herold, in which the partner was wounded with a gun shot, the Scarecrow became a news phenomenon. When Herold refused to co-operate, the Scarecrow sealed his reputation by killing him. In the meantime, Bruce Wayne, a patron of Gotham University discussed the case with a member of Crane's department with whom he was acquainted. Crane's name came up, along with his odd habits and the revelation that he had been recently dismissed for his fanatical teachings on the subject of fear. Wayne, in his guise as Batman, pursued the case. In his second outing, the Scarecrow approach the manager of a failing department store, Richard Dodge and offered to rob rival stores to improve business as Dodge's. After his first theft, he was tracked back to his home by Batman. After a visit from the disguised hero, Crane witnessed Batman and Robin plotting to take their case back to Dodge. Enraged, Crane donned his guise as the Scarecrow, determined to kill Dodge before he could be questioned. En route, he was intercepted by Batman and Robin, who carted him off to prison after a melee in the city playground (World's Finest #3). Crane spent two years in Gotham State Penitentiary. In 1943, he emerged to wage crime in Gotham again, this time using a more pedestrian format. Organizing a gang of thugs as his assistants, he based a series of crimes on bookish lesson of rhymes, stealing some expensive hats and following up with crimes based on words rhyming with hat. In his final foray to a dealer in Chinese antiquities named "Yat", he and his gang were rounded up by Batman and Robin and returned to prison (Detective #73). The events of in Crane's life between 1943 and 1955 remain shrouded in mystery. It is known, however, that when he emerged again in 1955 he had developed an impressive arsenal of hallucinogenic chemical designed to cause fear. During a crime spree, he caused Batman to imagine that he friends and colleagues had vanished into thin air as a particularly aggressive form of autophobia (fear of isolation). Losing his friends, Batman turned to an enemy, Selina Kyle, to help track down the Scarecrow. The case brought the two close together and when it was completed, they had determined to wed (Brave and the Bold #197). The final fate of Jonathan Crane was never revealed. Powers: Crane lacked true super-powers but was especially agile and strong for his wiry frame. He was also well-versed in psychology and eventually developed sufficient expertise in chemistry to design custom hallucinogens. Weaknesses: Crane was a normal human when stripped of his weapons and chemical and could be captured as such.